Electronic Software Delivery (ESD) is a digital delivery of a product key directly to consumers and small businesses via reseller, retailer and e-tailer partners. Microsoft Office 365 is a great product for cross sell and up-sell. PC, Notebook, tablet or smartphone with any OS installed - Windows, iOS or Android - it could be used on all of them. This is famous Microsoft Office but sold in the subscription model. With all the latest applications and 1TB of OneDrive cloud storage provided the Office 365 is the best offer with any device chosen by a customer. Microsoft Office 365 will bring you even more earnings due to regular renewals. Purchase ESD product key via ASBIS B2B e-shop. Immediate delivery after order verification. Product key could be passed to integrator/reseller or product key could be emailed directly to end customer. Upon order processing partner gets order confirmation. End customer purchases Microsoft ESD product in B2C e-shop. Full integration via ASBIS API allows to proceed order automatically. End customer will receive email with product key and instructions. E-tailer will get the order confirmation. This integration will allow your customers to get product key at the cash desk on purchase receipt. To learn more about integration for retail, please, contact us. Microsoft ESD products is a great opportunity to grow your business! A full Office suite is not included on most new devices – recommend an Office suite with every device sale. Customers want Office but they are 5x more likely to purchase Office only if you recommend it. Talk to your customers and promote it. Save your time, offering products with an instant availability and a few minutes delivery. Implement API integration with ASBIS B2B e-shop and process your orders automatically. Your customers will appreciate easy and secure purchases with an instant delivery from your B2C shops. 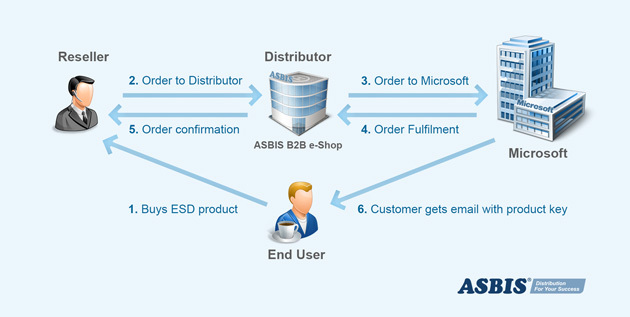 Digital distribution of Microsoft ESD products were successfully implemented by ASBIS partners in all three channels across different countries. Our partners, who implemented API integration and started ESD sales have acquired leading places in electronic software sales and grew revenue rapidly. Catch the opportunity now! Contact ASBIS Experts in your country today or email us to get more information about ESD business with ASBIS.